1 Oyster Piezopickup with socket for interior mounting. Our Oyster pickups give your instrument a natural, warm, full sound instantly, without active switching or preamps. The outstanding sound is realized through the perfect interplay of three elements, the membrane, the piezo and a special high-quality plastic contact gel. All Oyster models are fixed to the instrument either with double sided adhesive tape or alternatively, with removable adhesive pads which do not damage the surface of the instrument. Thin adhesive tape is recommended for guitars that are quite resonant. If however, very loud signal strength is required, an adhesive silicone rubber pad is preferable. Instructions: Cut a 2cm piece of double sided adhesive silicone rubber pad or tape, remove the protective foil and stick it to the underside of the pickup, then stick the pickup onto the guitar. Finished! With a high-quality 1/4" jack socket including cable strain relief, screw nozzle and strap button. Professional quality, secure mounting and perfect shielding make the Oyster pickup all the more valuable! Our Oyster pickups have a capacity of 74 pF. We recommend a minimum output impedance of 1 (to 5) MOhm. 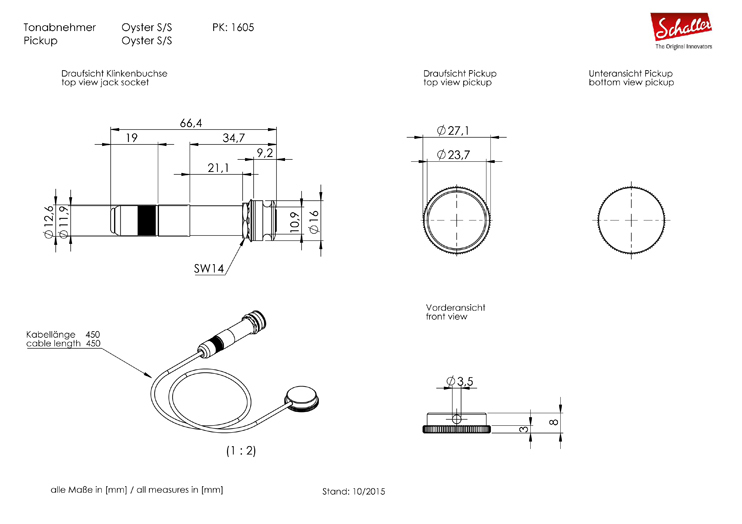 In principle you can use our Oyster for all different kinds of instruments. The sound depends on the position at your instrument, please try! Models which have two capsules are positioned so that the second capsule is placed close to the bass strings. The control box should always be affixed using double sided adhesive tape and positioned so that it is easy to reach while playing. Carefully remove the pickup without putting any strain on the cable. You can loosen the pickup more easily by turning the capsule from side to side (clockwise and anticlockwise). When you have removed the capsule, you can remove any remaining self-adhesive material with a little guitar polish. For powerful playing that includes percussive elements played on the guitar’s top attach Oyster piezo elements underneath the top in a straight line with the bridge and close to the sides. 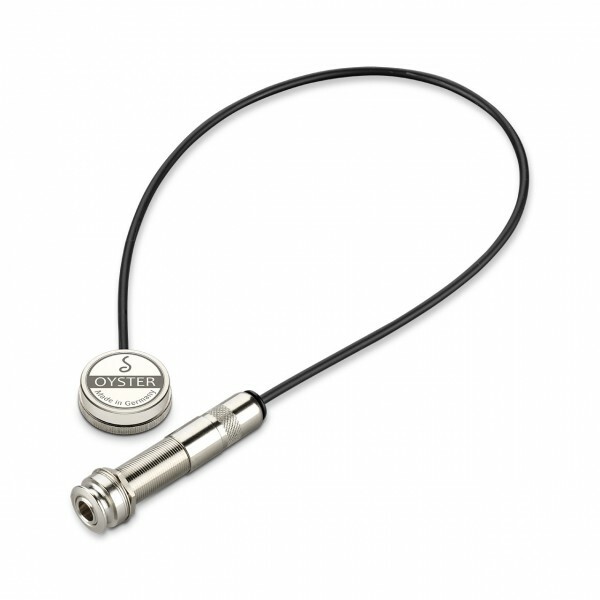 For normal or lighter playing attach Oyster piezo elements left and right directly underneath the bridge.